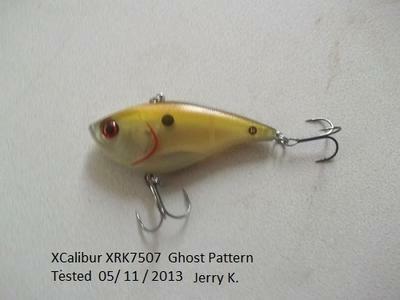 I was asked to field test the (Ghost pattern XRK7507) XCalibur XRK75 "One knocker" Lipless Crankbait from Pradco Fishing. The XCalibur XRK75 "One Knocker" is 3" inches in length and weighs ¾ of ounce. It comes in a wide array of colors with 3D eyes, a realistic bait fish scale pattern, and red gill slots etched on the sides that enhance its lifelike appearance. Its unique single forged tungsten rattle - lead weight design - emits a distinctive, deep rattling sound. Couple that with ultra-sharp TX3 treble hooks and you have one sweet lure that fish pick up on and won’t let go. 1.) One of the most common problems associated with lipless crank baits is when you pause them they nosedive/spin as they sink causing the hooks to foul on the slack line. The XCalibur XRK75 did not spin when paused, it stays upright and glides horizontal as it sinks. 2.) The second was the ability to make long straight casts with the XCalibur XRK75, cast after cast. By comparison, I think the single weight design of the XCalibur XRK75 is the key to why it outperforms the multiple weight designs used in other baits. I’m assuming that the single weight in the XCalibur XRK75 acts like a weight forward stabilizer which helps to propel the lure a long way while keeping it straight and true as it flies through the air. During the retrieve when you stop/pause the lure I think the weight balances the lure keeping it upright allowing for a more natural lifelike fall. I was able to make long accurate casts even into the wind. I could feel the pulsing action of the lure as it came through the water and heard the single tungsten rattle as it got close to the boat. I fished it on a 7 1/2 foot, medium/heavy rod, with an Abu Garcia 5600 ambassador reel spooled with 20lb braid and 15lb fluorocarbon leader. Most of the fish caught hit the lure as it fluttered on a drop and sweep retrieve. During the test I caught several nice largemouth bass, with the biggest weighing 3.5 pounds. I was very pleased with the all-round looks, performance and durability of the XCalibur XRK75 lure. I will definitely continue to use it, and recommend it as a go to bait for monster bass.